What comes in the mail and makes an author dance herself silly? 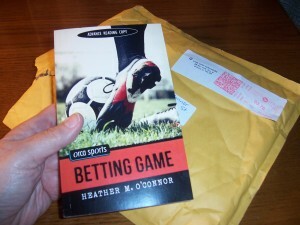 You guessed it–the Advance Reading Copy of her new book. Yup, that first rip-it-open-and-squeal moment. Seeing the book she worked on for so long. In the flesh–er, the paper. Real and readable. My first peek at Betting Game. What you DON’T get is the sound effects. The giggles. The dancing feet. The satisfied sigh.